This is the first time I have ever tried anything like this, so take my instructions with a grain of salt. 3M Clear Bra 12" x 30" sheet. Bottle of Alcohol (IPA). 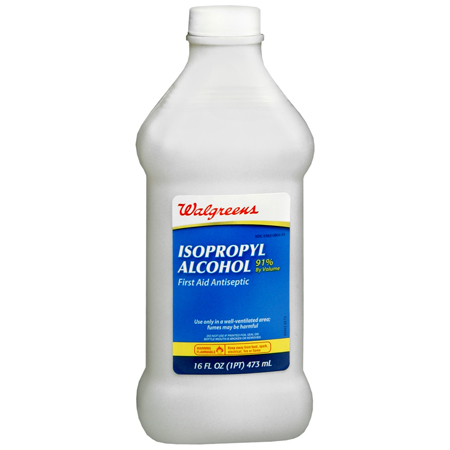 Mix in a spray bottle with 25% IPA, and 75% water. Bottle of Johnson's Baby Shampoo. Mix in a spray bottle with 1 drop shampoo/1 oz water. Scissors, Razors for trimming, Microfiber towels, Squeegee to push out water behind clear bra as you install it. A good clean work area. I cleaned the front of the plate with the IPA. I then soaked the front of the plate with the baby shampoo mixture. 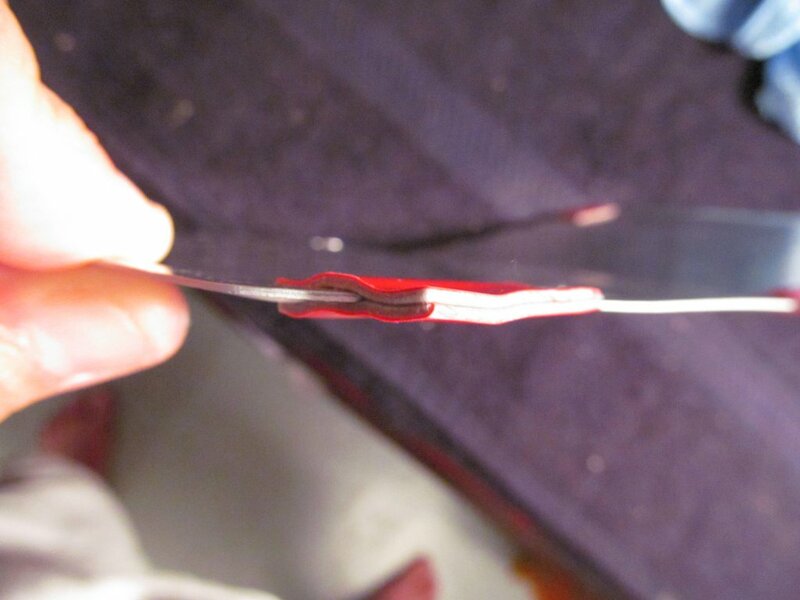 I then pealed the backing off the 3M Clear Bra. This is STICKY stuff so don't let it touch anything. 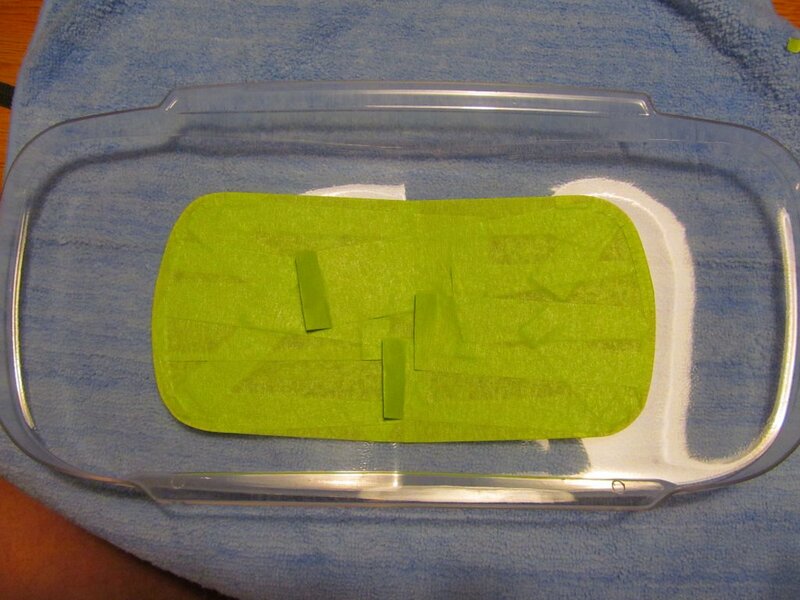 Soak the back of the clear bra with the shampoo mixture, and lay it across front of the clear plate. 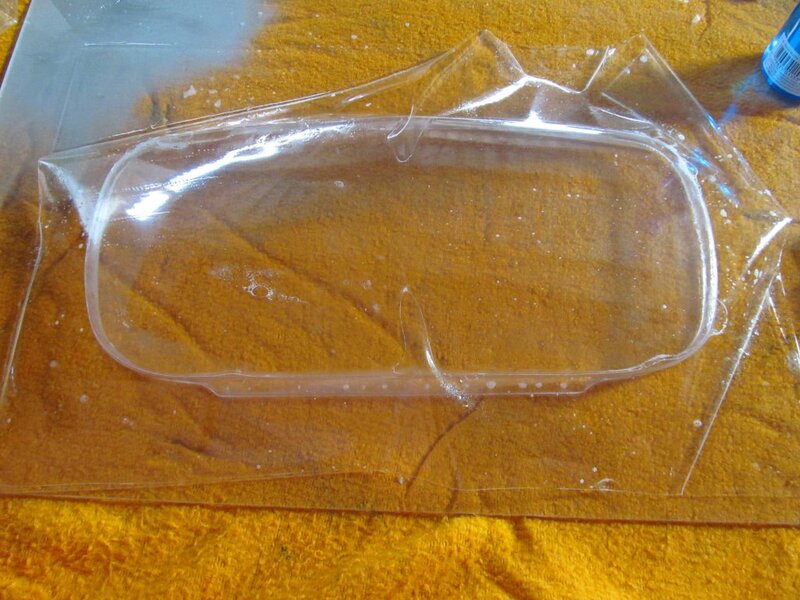 The 3M clear bra should move around easily on the surface of the clear plate at this time. 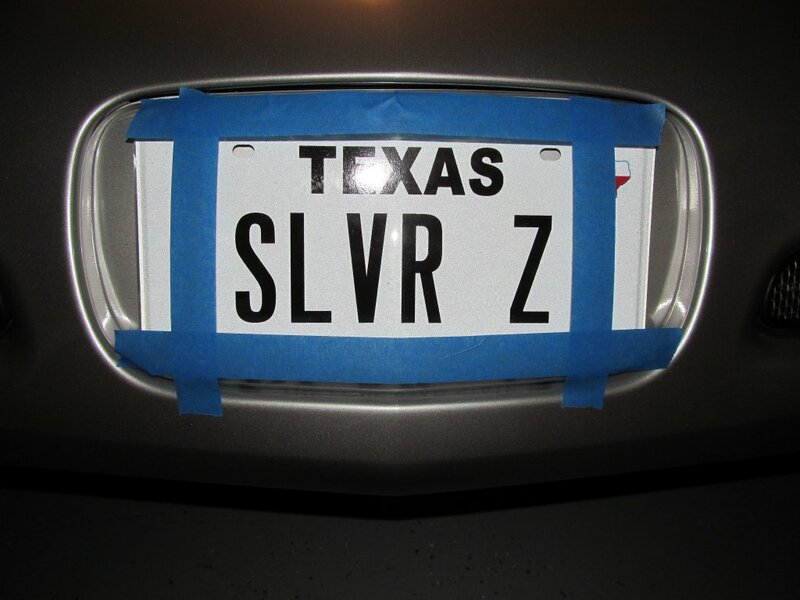 You may see some "hazing" on the front of the plate as your doing this. Don't worry it will go away. 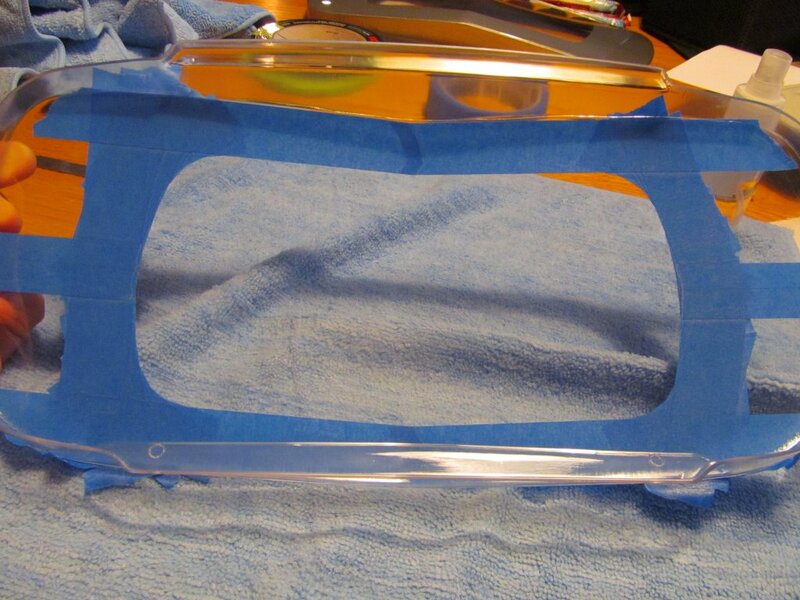 Start using the squeegee to work out the water from between the clear bra, and the clear plate. 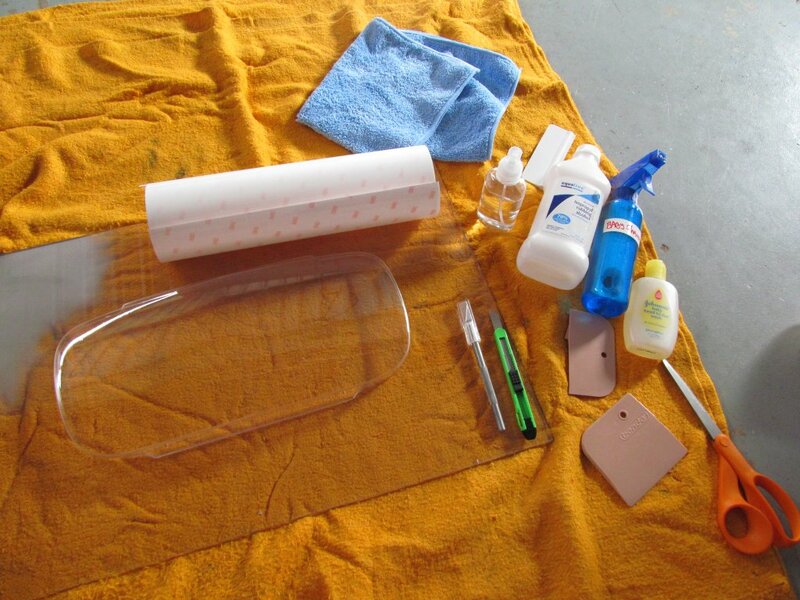 Continue to spray the TOP surface of the clear bra with shampoo mixture. It keeps the top surface lubricated when running the Squeegee across it. 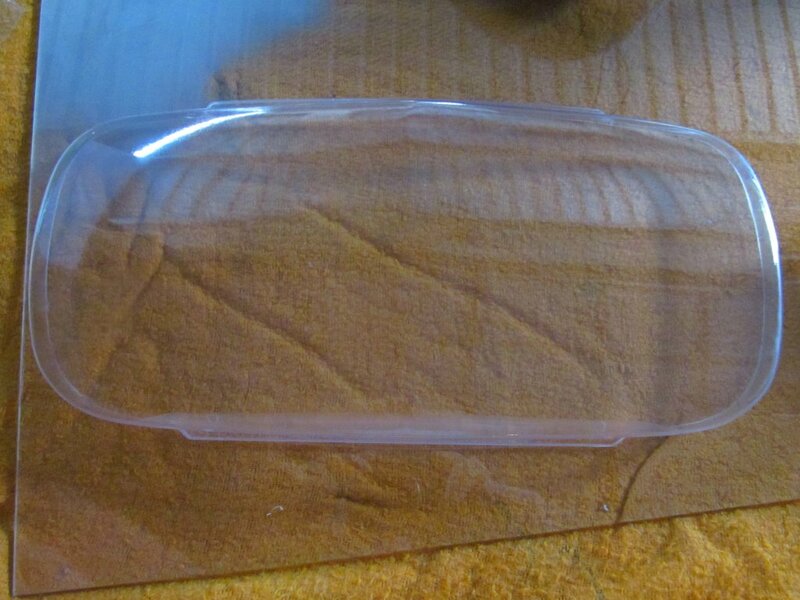 Work out ALL the air bubbles from the center outwards. 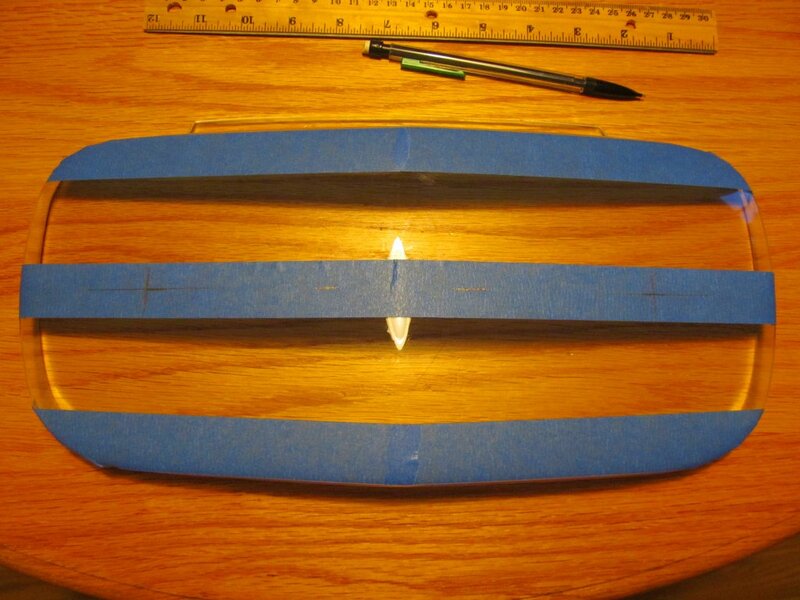 I was not able to get it to wrap around the edges very well (Never done this before) so I trimmed the edges about 1/8" from the front face. Once all the air and water is removed from between the clear bra anc clear cover... spray the edges with the IPA mixture. The IPA solution will very quickly seal the edges. 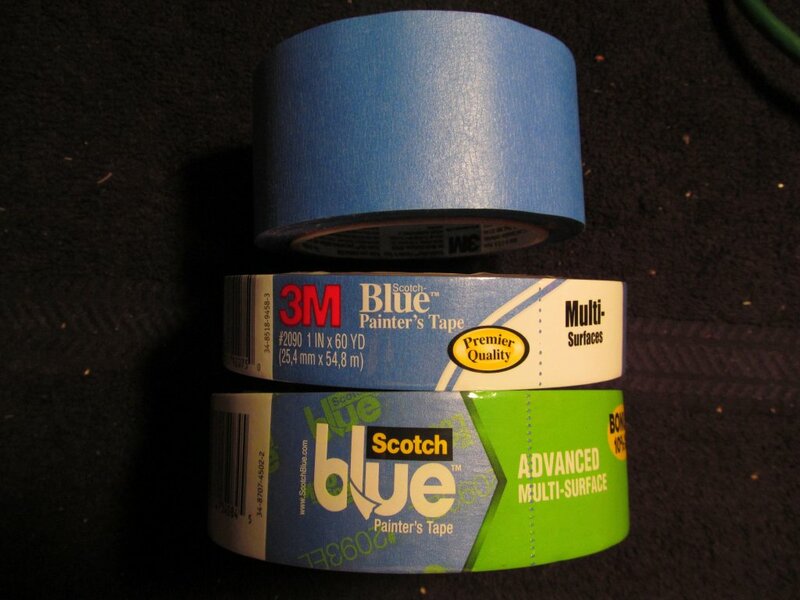 3M Blue painters tape for general masking. 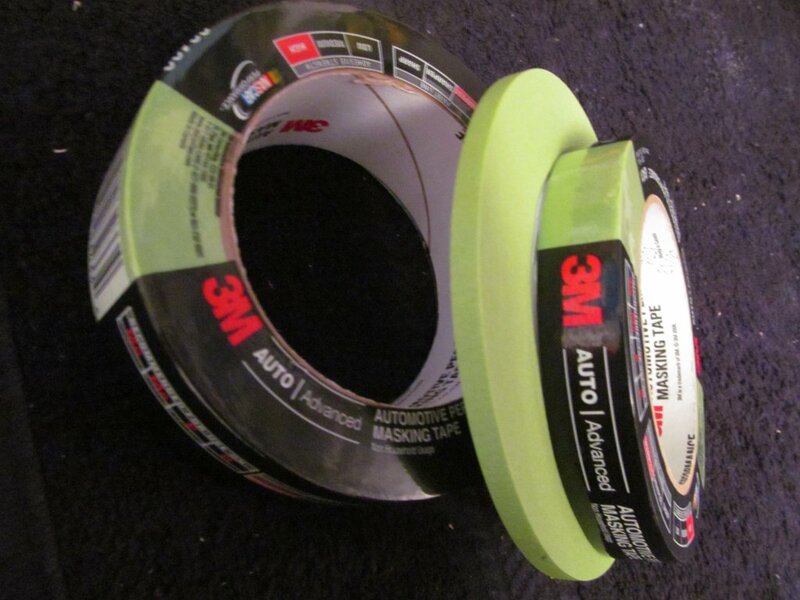 3M Automotive masking tape for paint lines. 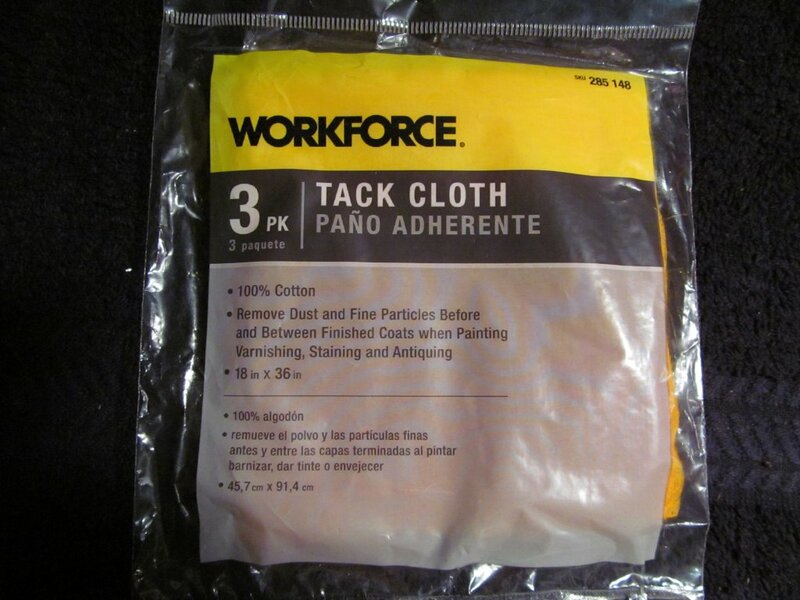 Tack Cloth for removing dust/lint before painting. 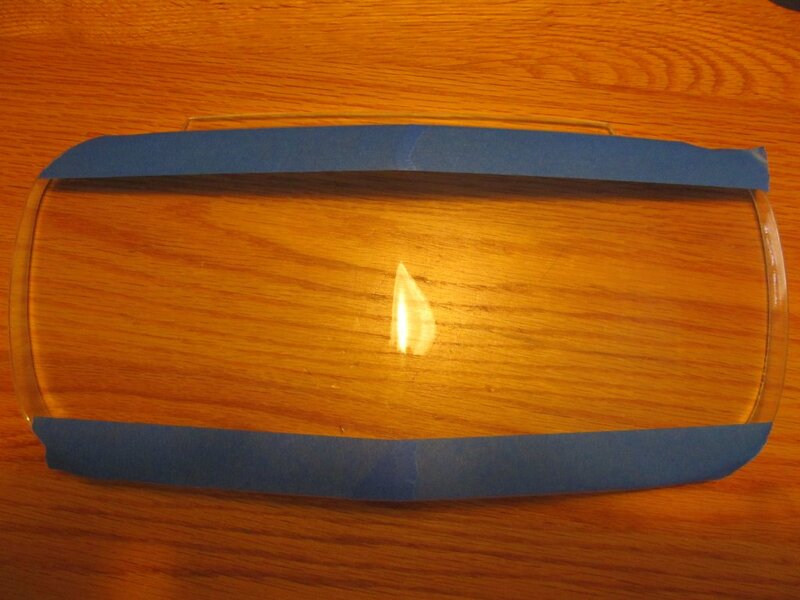 3M Double sided foam tape. 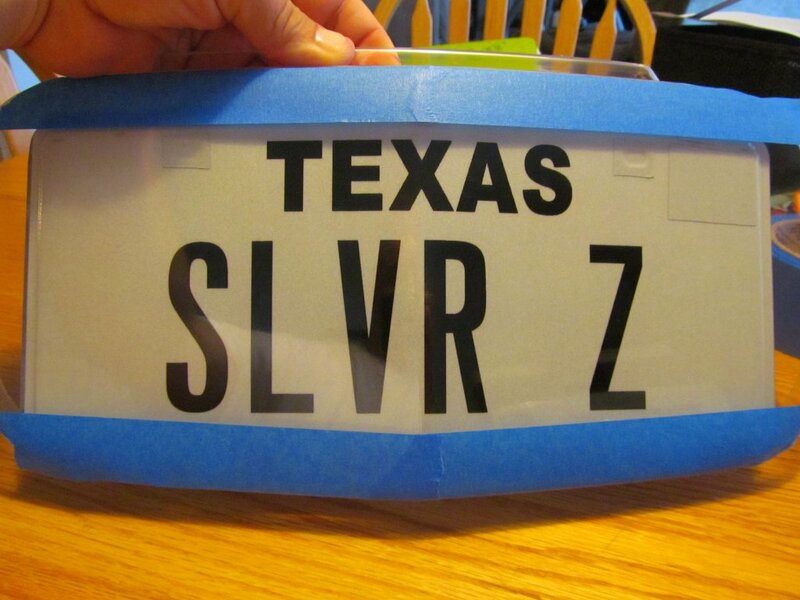 Here is how the clear plate looks like on a stock mounted license plate. This is NOT the look I wanted. 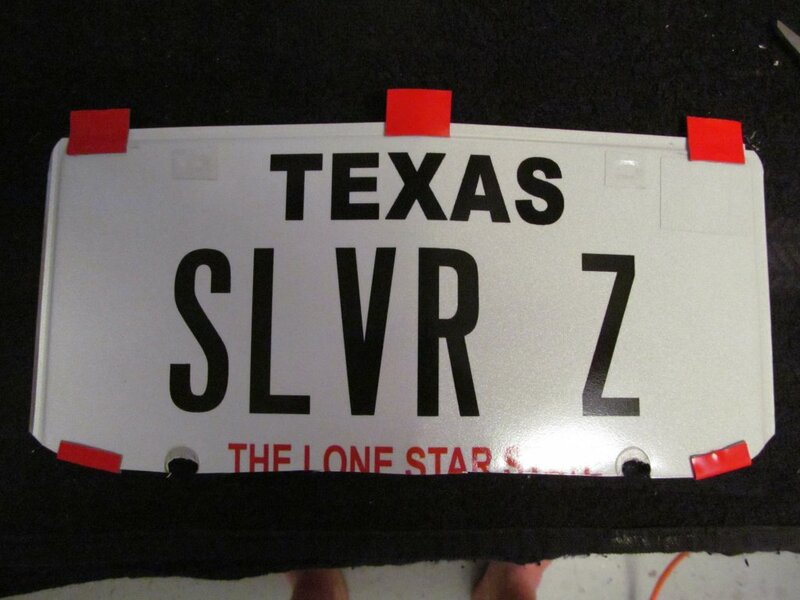 First I decided that I wanted to cover up everything on the plate except for the text. 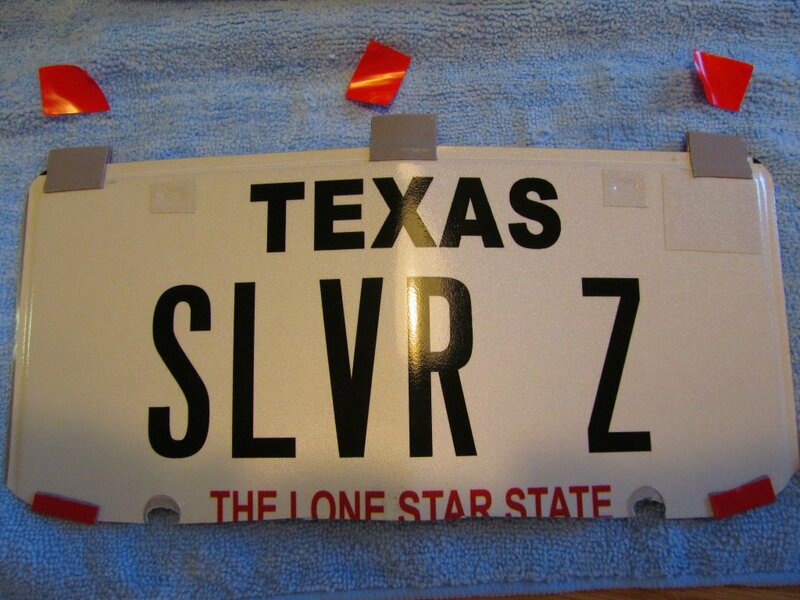 I had an old plate in my garage that I stripped off the sticker to use on my new setup. 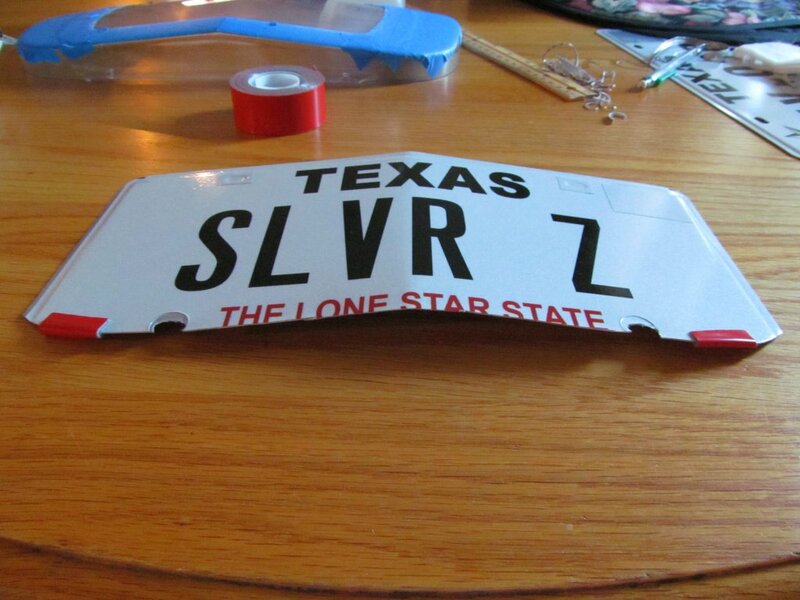 I put the stickers to cover the holes, and the Texas logo. 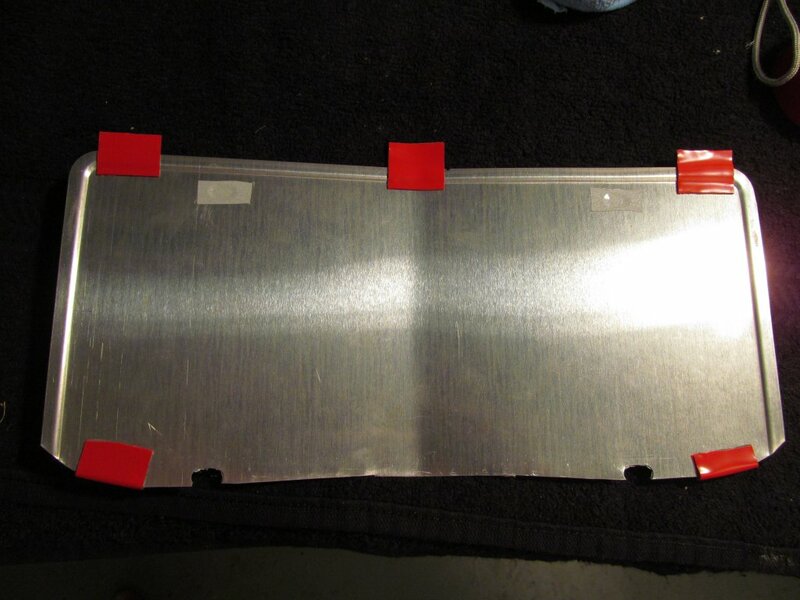 I knew that I wanted to mount the plate "INSIDE" the clear cover. 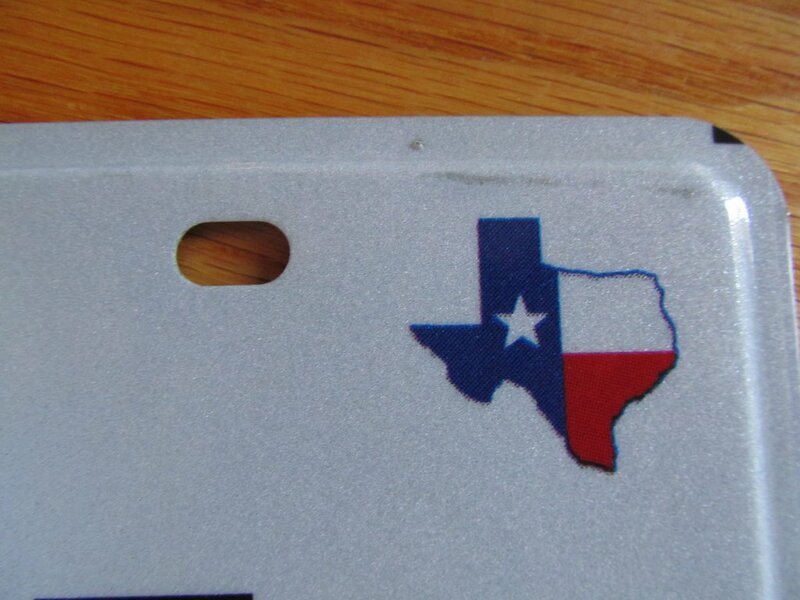 This would push the plate as far forward as possible so it's more visible from the side. 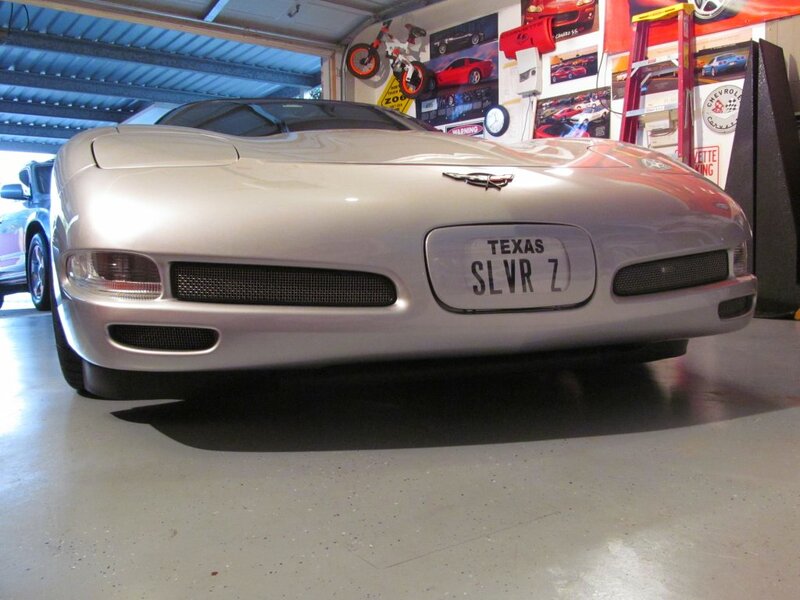 I bent the plate in the middle to match the contour of the clear plate. 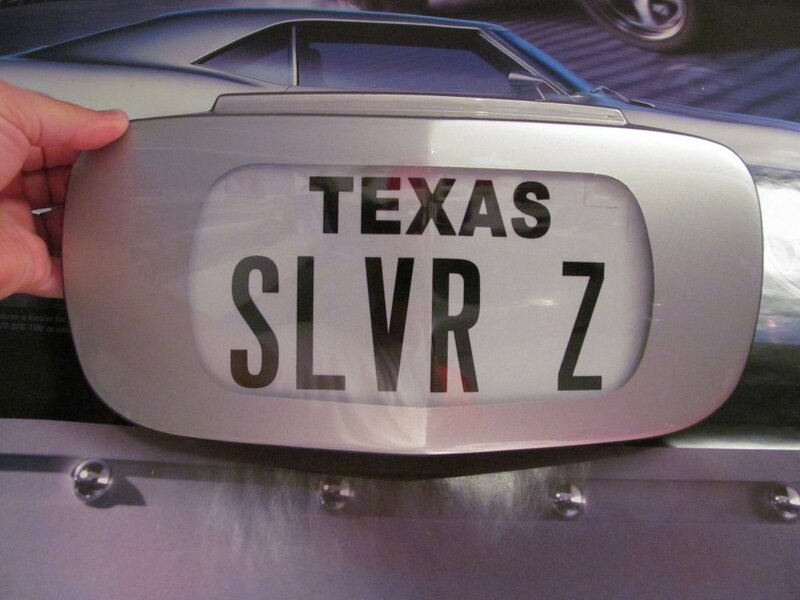 I also trimmed the bottom of the plate about 1/4" or so to "center" the text inside the clear cover. I decided thru measurements that I could paint a 1" upper and lower trim on the clear plate "IF" I centered the plate in the clear cover. 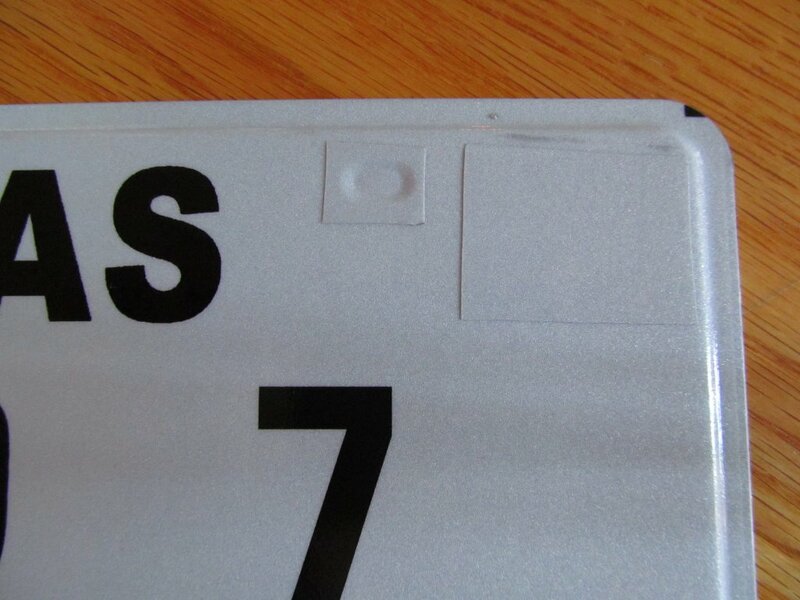 I used some 3M Foam tape on the bottom of the plate as a protector so the plate does not dig into the plastic cover. 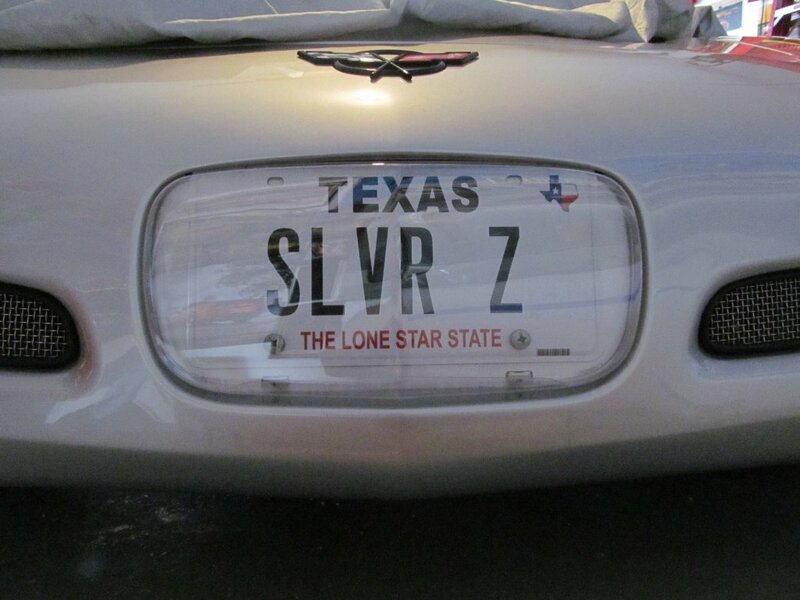 Once I centered the plate horizontally, I wanted to figure out how I would run the "vertical" angles. I determined for "my" application that I could paint 2.5" from the outer edge inwards on both sides. I centered a piece of tape to mark off 2.5" from both edges, and give me an idea where my center is when creating my vertical lines. I created my vertical lines and angles I wanted. 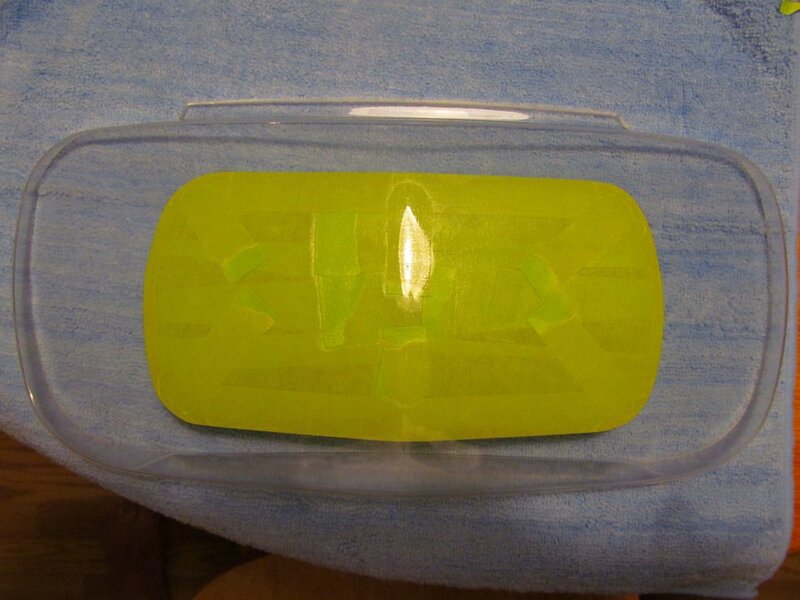 I removed the center piece of tape. I then "rounded" off all the sharp corners of my vertical lines. Before you go further, ensure that everything is correct with your masking. 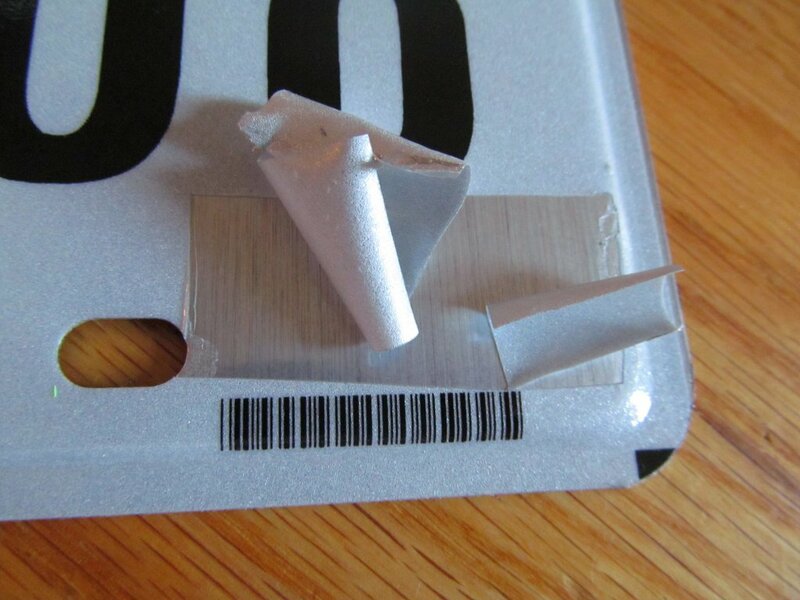 Once your happy with your design, begin to mask off the inside of the plate. 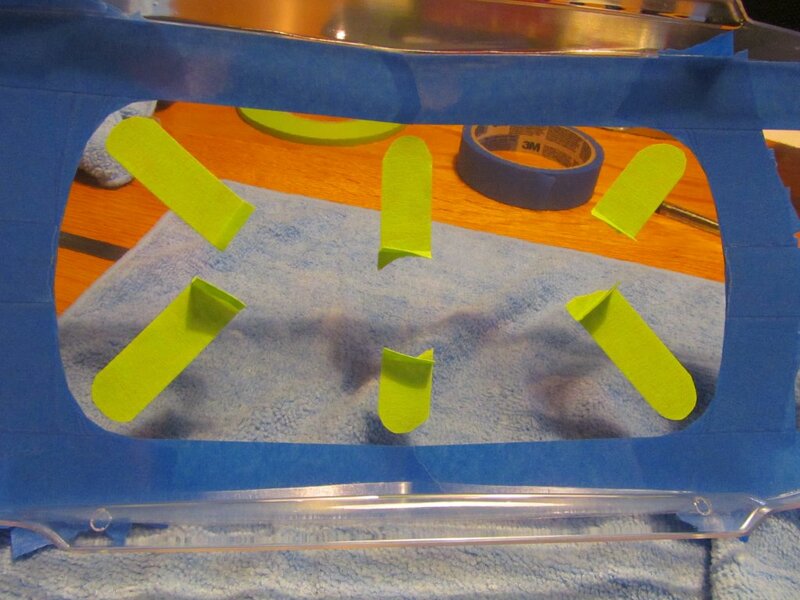 Create "pull" tabs so it's easier to remove the tape after painting. Remember that you're going to be pulling off the tape when its WET ! ! ! 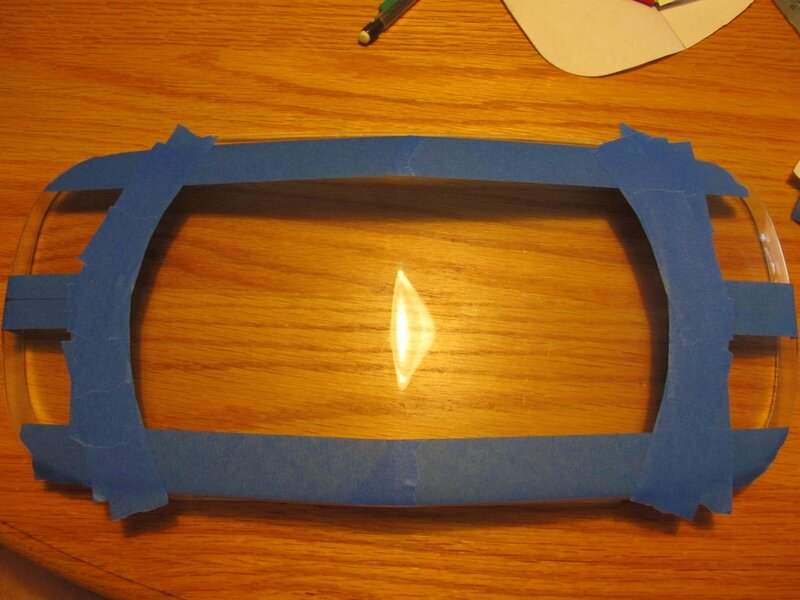 Continue masking off the center area. 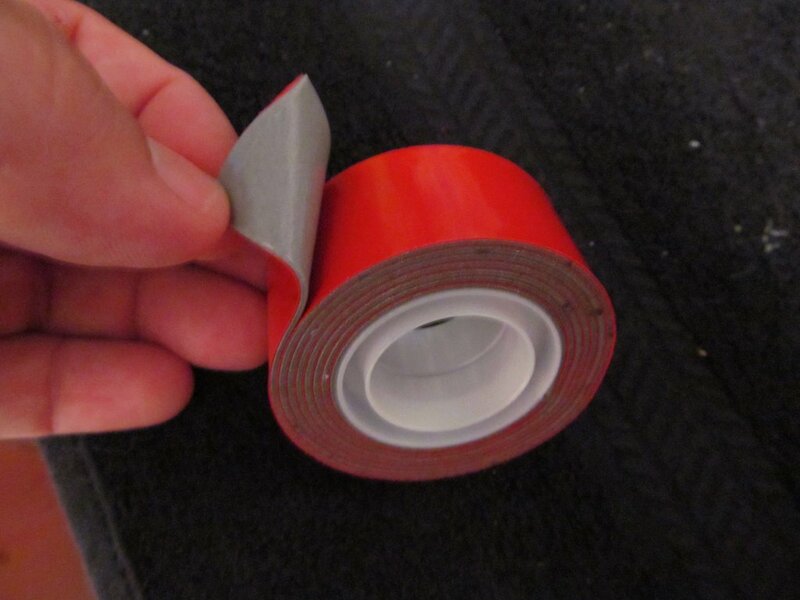 Remember to create "tabs" on your tape so you can easily pull the tape off when wet. 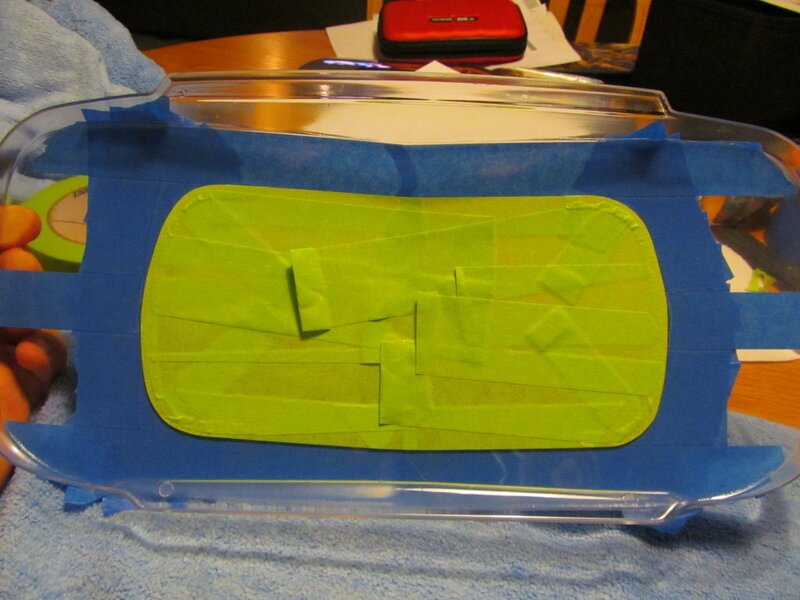 Ensure that your tape is firmly on the plastic so it does not bleed onto areas you don't want painted. 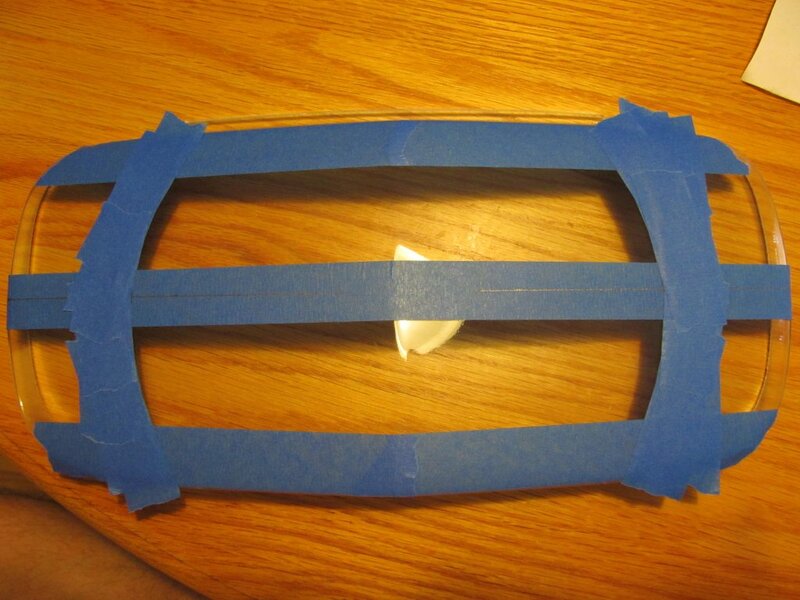 Once your happy with the masking in the center, then remove all the tape on the front side of the plate. 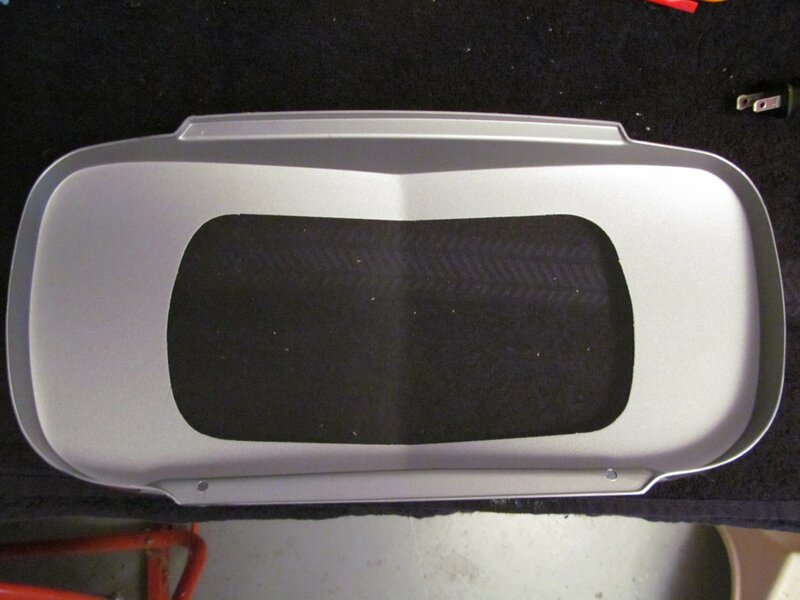 Inspect your masking and make sure it's exactly what you want. 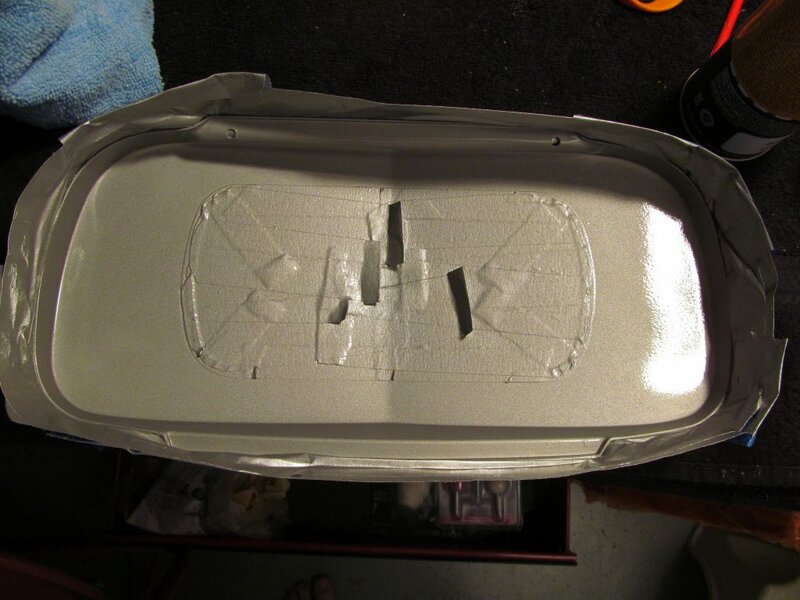 Protect and mask off the front side of the plate and the sides BEFORE you paint. Clean the surface to be painted with IPA (Alcohol). 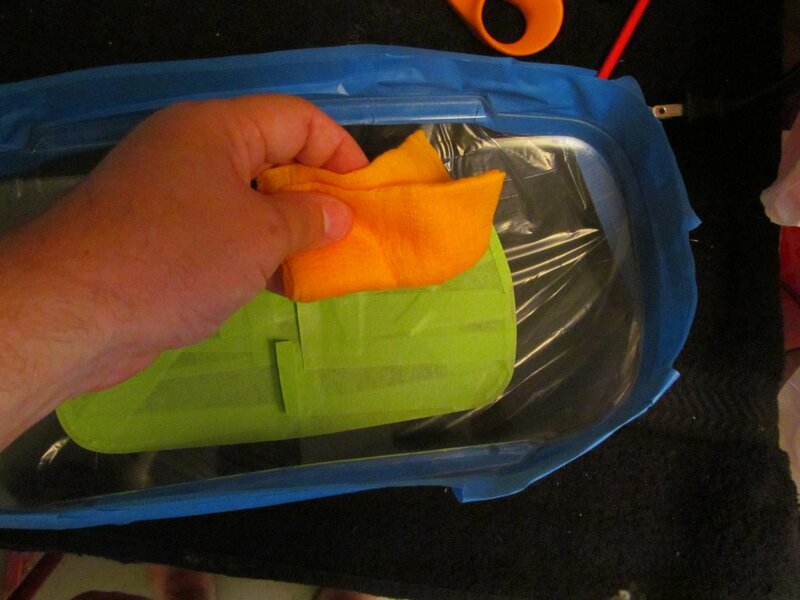 Clean the surface to be painted with tack cloth to remove any dust or lint. 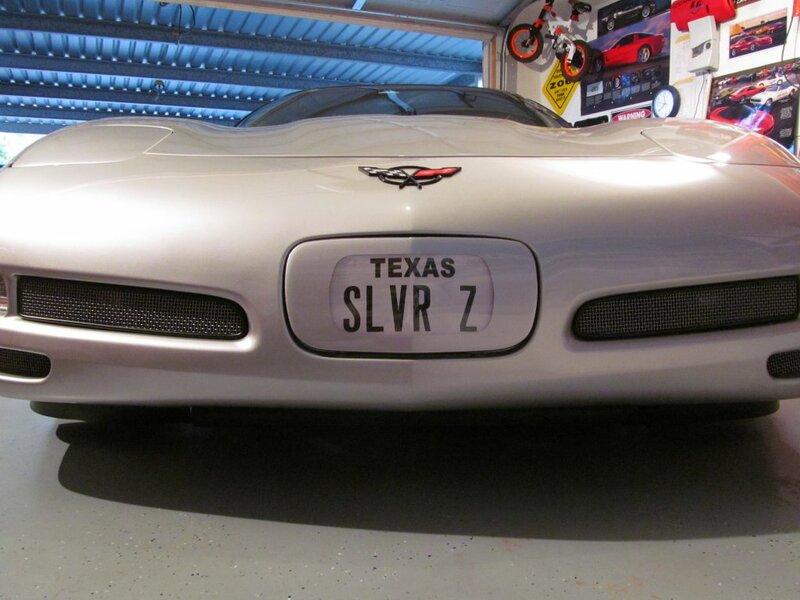 Here is my cover after paint. Make sure you paint your cover in the day light. 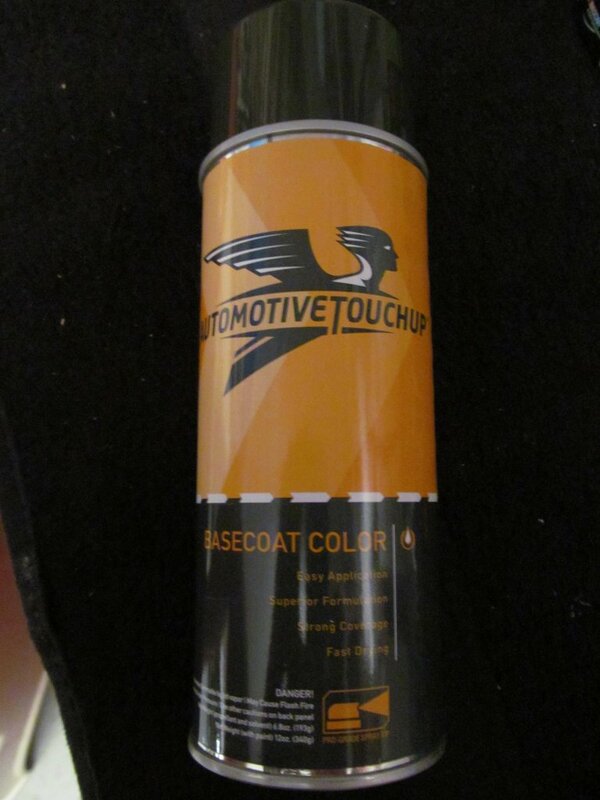 It makes it easier to see if your paint is light in areas. 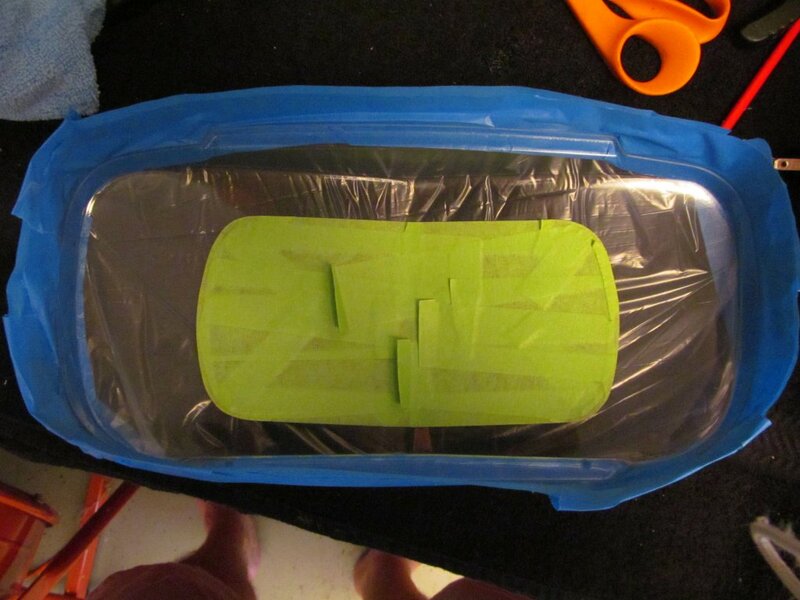 Remove all the masking tape when the paint is still WET ! Let it dry 24 hours before touching it. It should dry quite well in an hour though. 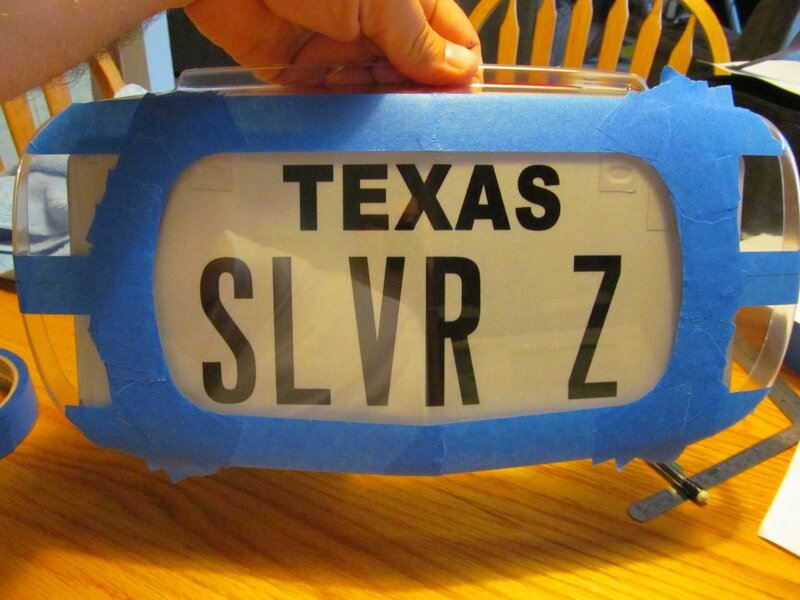 I used the 3M double-sided sticky tape and put a piece on both sides of the plate. 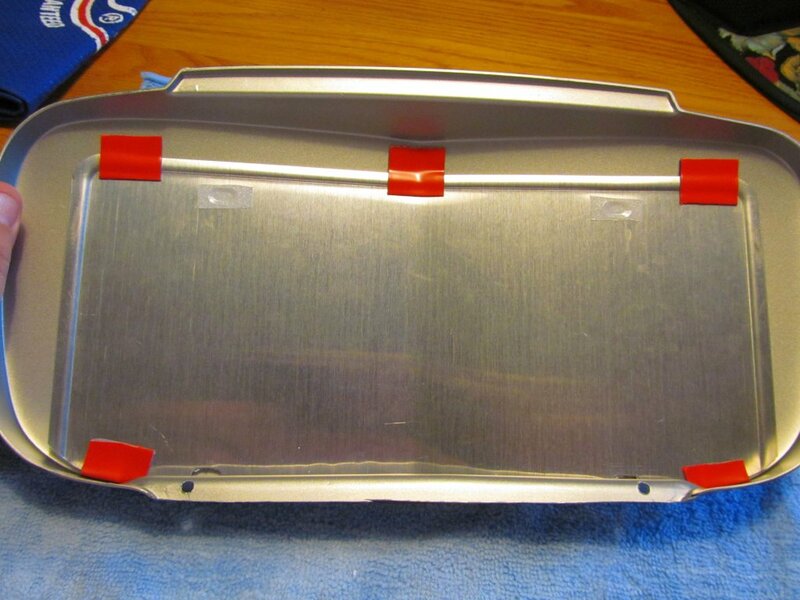 Once it comes time to stick your plate into your clear cover you will remove the red tape cover on the front side of the plate. 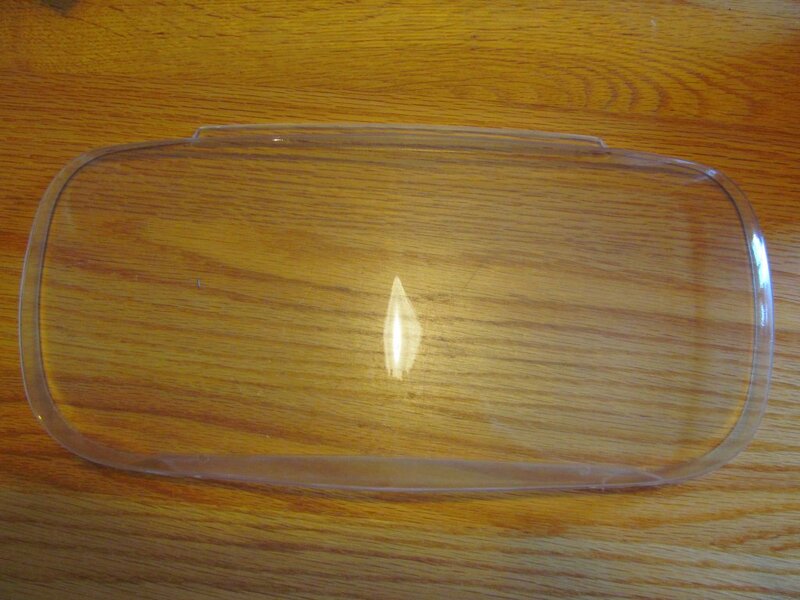 Stick the plate into the clear cover. 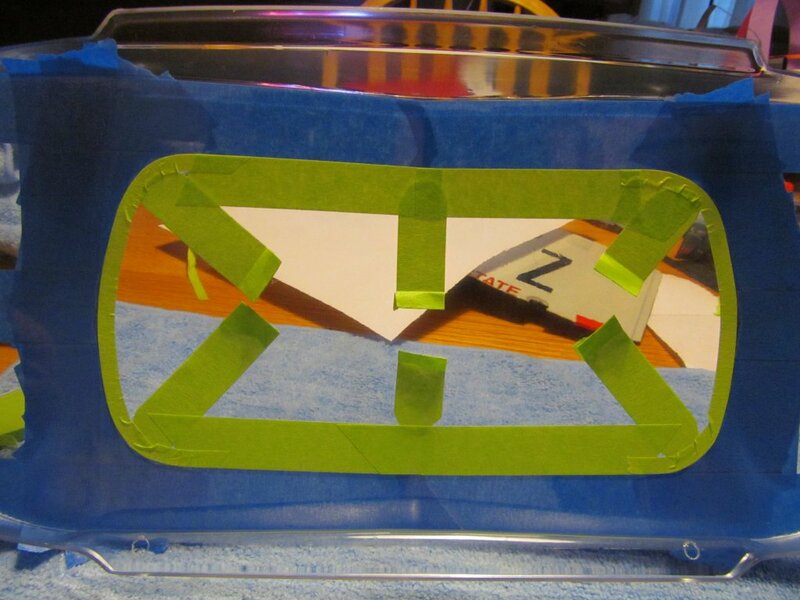 Ensure that it's centered before sticking in there because the 3M tape is VERY sticky. 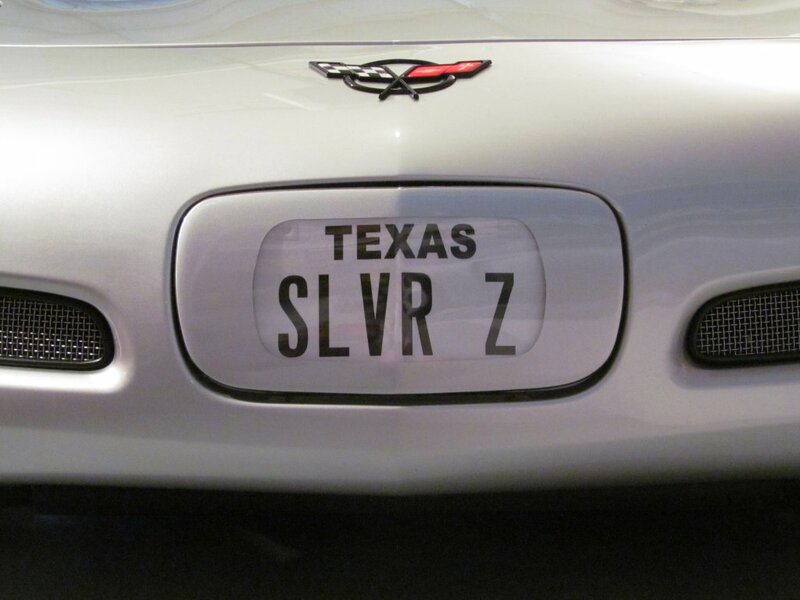 Install your new custom plate on to your car ! 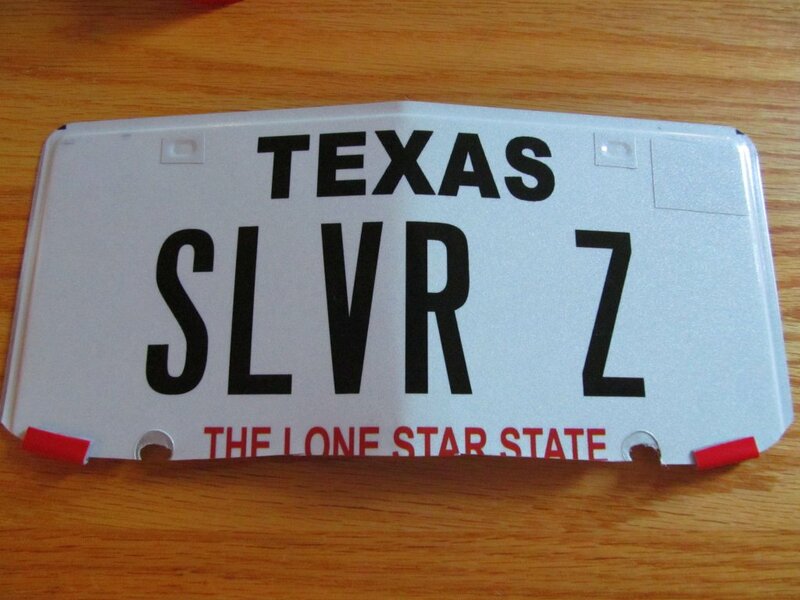 Save yourself some Police fines, and look good while having a custom plate !